Family trusts can be quite complex and difficult to set up correctly, and many people don't realise just how beneficial a trust can be. Even for families of average income, trusts deserve a second look. 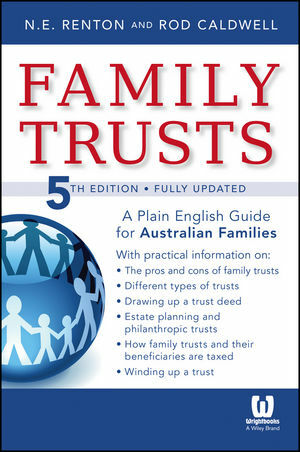 Family Trusts: A Plain English Guide for Australian Families of Average Means, 5th Edition is a comprehensive guide to the advantages and disadvantages, investment nuances, taxation regulations, and social security rules surrounding trusts. This book, by author Nick Renton, and newly updated by Rod Caldwell, provides the information you need to make an informed decision and ask the right questions of your financial and legal advisors. The book also includes real-life case studies that provide examples of proper handling and help illustrate important concepts. Additionally, alternatives are discussed for situations where a family trust may not be the best structure to use. If you're an average person wishing to ensure your family's financial well-being, Family Trusts: A Plain English Guide for Australian Families of Average means, 5th Edition is the most complete guide on the market. NICK RENTON was a consulting actuary and writer, well known for his professional guides on meetings procedure and voluntary associations, and for his many books and articles on investment, business, taxation and retirement issues. Nick passed away in August 2010.